The 20-year-old daughter of the late Steve Irwin, who has been in a long-term relationship with the 21-year-old athlete, has recently been sparking engagement rumors. 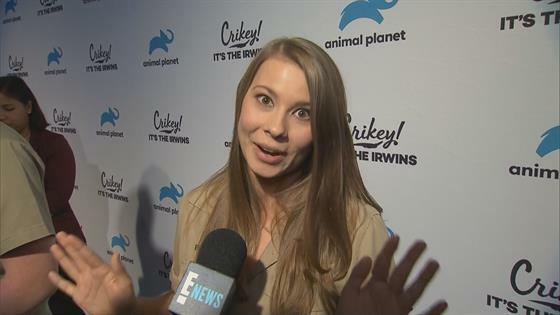 But Bindi has now cleared up all of the speculation during an exclusive interview with E! News. "There's always a few engagement rumors swelling, but I promise you, I can clear the air, we're not engaged yet guys," Bindi told us at the Crikey! It's the Irwins premiere. She then went on to promise us, "But I swear I will let you know when it happens, really." "We're really lucky, we are sharing our lives together and we're on this amazing journey," Bindi said. "And I think that as human beings we always forget to enjoy the moment. And for us right now we're enjoying doing our conservation work together and filming our brand new series, and it's all happening and we're just enjoying it now." "I'm so lucky, I have the best family and I found my person in life," she told us of her beau. "I mean, Chandler's just amazing." So what's Bindi's idea of the perfect date with Chandler? Find out that answer in the video above! Crikey! It's the Irwins premieres Oct. 28 on Animal Planet.